The history of protective respiratory equipment can be traced back as far as the first century, when Pliny the Elder (circa A.D. 23-79) described using animal bladder skins to protect workers in Roman mines from red lead oxide dust. In the 16th century, Leonardo da Vinci suggested that a finely woven cloth dipped in water could protect sailors from a toxic weapon made of powder that he had designed. Alexander von Humboldt introduced a primitive respirator in 1799 when he was working in Prussia as a mining engineer. 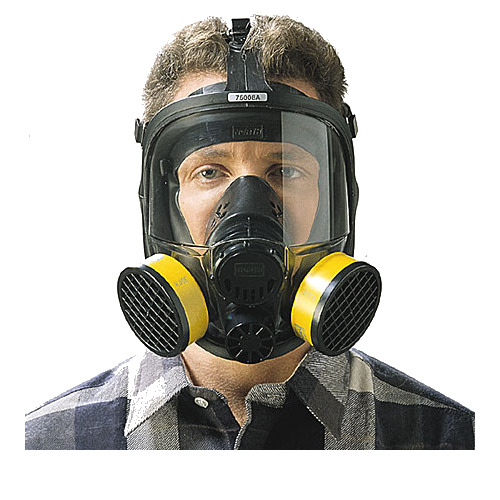 Practically all the early respirators consisted of a bag placed completely over the head, fastened around the throat with windows through which the wearer could see. Some were rubber, some were made of rubberized fabric, and still others of impregnated fabric, but in most cases a tank of compressed air or a reservoir of air under slight pressure was carried by the wearer to supply the necessary breathing air. In some devices certain means were provided for the adsorption of carbon dioxide in exhaled air and the rebreathing of the same air many times; in other cases valves were provided for exhalation of used air. The first US patent for an air purifying respirator was granted to Lewis P. Haslett in 1848 for his 'Haslett's Lung Protector,' which filtered dust from the air using one-way clapper valves and a filter made of moistened wool or a similar porous substance. Following Haslett, a long string of patents were issued for air purifying devices, including patents for the use of cotton fibers as a filtering medium, for charcoal and lime absorption of poisonous vapors, and for improvements on the eyepiece and eyepiece assembly. Hutson Hurd patented a cup-shaped mask in 1879 that became widespread in industrial use, and Hurd's H.S. Cover Company was still in business in the 1970s. Inventors were also developing air purifying devices in Europe. John Stenhouse, a Scottish chemist, was investigating the power of charcoal, in its various forms, to capture and hold large volumes of gas. He put his science to work in building one of the first respirators able to remove toxic gases from the air, paving the way for activated charcoal to become the most widely used filter for respirators. British physicist John Tyndall took Stenhouse's mask, added a filter of cotton wool saturated with lime, glycerin, and charcoal, and invented a 'fireman's respirator,' a hood that filtered smoke and gas from air, in 1871; Tyndall exhibited this respirator at a meeting of the Royal Society in London in 1874. Also in 1874, Samuel Barton patented a device that 'permitted respiration in places where the atmosphere is charged with noxious gases, or vapors, smoke, or other impurities.' German Bernhard Loeb patented several inventions to 'purify foul or vitiated air,' and counted among his customers the Brooklyn Fire Department.